The summer is blowing by and we are just one weeks away from the Tuesday of the first week of the 2018 Women’s NCAA Division I season (with matches starting later in that week). To countdown the final five weeks, we are previewing each of the top five teams in our Way-Too-Early 2018 VolleyMob Top 25 Power Rankings. To kick things off we talked with Heather Olmstead about #5 BYU four weeks ago, Kelly Sheffield about #4 Wisconsin three weeks ago, John Cook about #3 Nebraska two weeks ago and Hugh McCutcheon about #2 Minnesota last week. 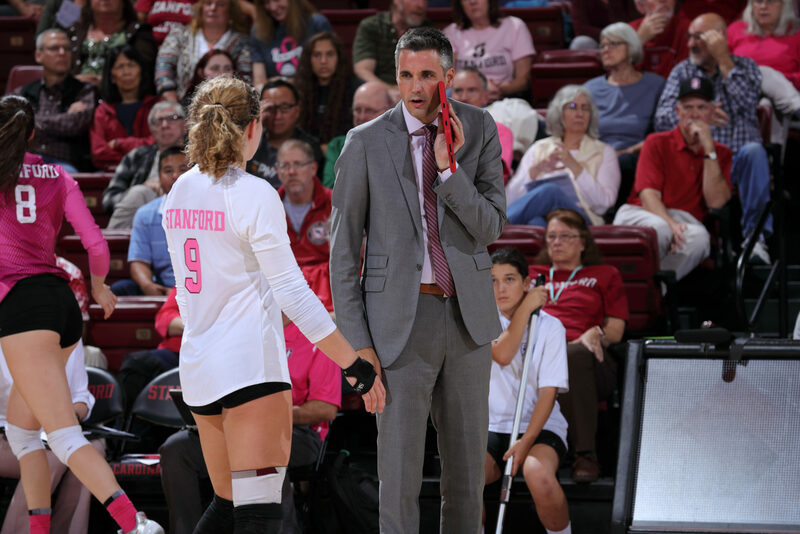 Today, we catch up with Stanford head coach Kevin Hambly about his top-ranked Stanford Cardinal. Additionally, the podcasted version (that includes more than just talking with Hambly) can be heard here. Q: For most teams making the Final Four would be something to celebrate for years down the road, but it almost seemed like after winning the title there was some disappointment in ‘only’ making the National Semifinals. Did you find yourself after time was taken to sit back and realize how good of a season 2017 was or is it something you’re just moving forward from with motivation for 2018? A: I think we had a good year – I think we felt we had a good year, it just wasn’t a great year. We felt good about how we played in conference and felt like we were on a good run, it was just that one match that we didn’t feel good about against Florida. I think all of us have hung onto that and when you look back onto the season that’s what you remember, your last match. All of us are looking at it from the coaches to the players as a disappointing season because of how it ended, but with the realization of we did some pretty good things and won the league for the first time since I think 2014. We had a lot of goals that we set and the only one we didn’t accomplish was winning the National Championship and so when you don’t accomplish all of your goals of course you’re going to look at it that you failed at some level. Q: What was it like coming into a program as the head coach of a team that a year prior won the National Championship? A: Obviously the expectation is that you’re going to do that every year and the sophomore class from last year were pretty heralded and then with Merete Lutz coming back – who was also an All-American – the expectations were if you don’t win it that you’re going to fail. I came into it knowing that and I felt like this is what I knew I was signing up for; I think a lot of people feel like I’d feel a whole lot more pressure but I really didn’t than what I felt at Illinois. I felt more like this is what the expectation is, that this group should be in the mix to do it and so let’s just see how far we can take this team, how much can we build the culture and I just kind of lived in the moment throughout the whole thing. It was trying to get the players to buy in to this whole new process instead of replicating the season before and I think they did that. Q: Five starters and the libero return. Before getting into what you bring back, what does the loss of Merete Lutz mean and who do you envision filling that role? A: We played Stanford and I think we were part of her first really good match against Illinois when I was coaching there, so I’ve always been a fan of Merete and have kind of watched her career. She’s a unique physical specimen and a great competitor; that’s what it looked like from the outside. When I was able to coach her in the spring and fall I was just really excited for her because I thought she made tremendous progress, as she did every year. The thing that surprised me and that we will miss the most is her competitiveness. I knew there was competitiveness but not to this level – she’s one of the best competitors I’ve ever been around. And she was great when it mattered the most; whenever it mattered she made plays. Q: Kathryn Plummer is coming off of a season in which she won Player of the Year. Is she kind of a unicorn to the game at that size where you’re not going to have many like her? A: I’ve never been around anyone like her. I was fortunate to coach with the national team and coach some great outsides and they were physical and all that, and not to say that she’s more or less physical, but just her size, physicality, way she handles the ball, volleyball IQ – she’s a great combination of a lot of great players and is pretty unique. I think the coolest part about it is she’s just trying to be the best version of Kat that she can be. She’s a special talent, no doubt about it. The thing that’s been cool is to see her develop: she got better through her freshman year and last year she made big strides. I think we’re just starting to scratch the surface with what she’s going to become and what she’s going to be. I’m excited to have a little part of that. Her best years are going to be 10 years from now as she continues to develop and play at the professional and international level. I think she’s going to make great progress over this season and next season, but she’s certainly unique. Q: Where does a player like that go in year three? Like what is there to still improve for her from last year to this? A: The main thing is her ball control, passing and defense. Getting better at that and trying to become an international level ball-handler. Serving wise she’s a little inconsistent and that’s something we always talk about. And then she can always make better decisions attacking and blocking – she would try to power through some things instead of playing smart – but the main one is just ball control. Q: How good of a relationship between setter and hitter is that between Plummer and Jenna Gray? A: I think Jenna has a great relationship with all of our hitters and understands them. She’s a unique leader – I haven’t been around many players that are as good of a leader, especially in a competitive setting, as Jenna. I think she conscientiously is trying to be the best she can be for all the hitters. The fact that [Plummer and Gray] have played together and that she’s set her so many balls certainly helps that relationship because there’s been a lot of time there but she’s trying to have a great relationship with all the players around her and she does a great job with that. That’s a lot of why we’ve had the success over the last couple of years that we’ve had. Q: You have an electric player at the libero position in Morgan Hentz. How much easier does she make life on others? A: She takes up a big chunk of the court. I’ve never seen anything like her playing defense. She makes some reads and does some things that I’ve never seen anyone else make. What people lose sight of is she makes the spectacular defensive plays, makes the easy plays and hard plays look easy, but her passing is the thing that sets her apart to me. I think she passed a 2.38 or 2.4 this season covering a lot of court and I think she’s the complete package as a libero. Certainly she takes up big chunks of the court on defense but she also does the same thing on passing and she’s what you want in a libero. She brings an incredible fire, energy and competitiveness and holds us all accountable which I think we all appreciate. Q: Audriana Fitzmorris and Tami Alade should bring strong play in the middle as well. With Alade you have that quick twitch athlete while Fitzmorris is the lengthy middle but both get their job done. Is it nice to have some differences in how they do it so you can approach matchups in different ways? A: Fitzmorris isn’t going to be playing middle for us anymore – she’s going to be moving to the pin. We’ll see how it all works out but she is probably going to be a right side or a left side. She played that with USA. Like you said Tami is twitchy, fast off the floor and incredibly efficient. She’s more of a prototypical middle. I feel like Fitzmorris is just a hitter that can do all of it. With the departure of Merete it gives us an opportunity to maybe slide her over there and play that position. We’ll start out looking at that on the opposite position, but we could also put her on the left and maybe play one of our freshman on the right. We’ve got lots of options to start with what we can do with Fitzmorris and I think her versatility is what makes her pretty special. Q: In terms of new players, is there anyone that you think can make an immediate impact for this team? A: Holly Campbell and Courtney Bowen are going to battle it out for the other middle position. Courtney’s a senior from New York City – she was a little behind when she came as a walk-on – and has really developed into a nice middle blocker; super physical and touches 10’10”. But then Holly Campbell, a refined middle blocker who is pretty special as a volleyball player. So I think those two will be battling it out and give us a little more depth than we’ve had in the past. Q: Did having that depth add to the conversation of moving Fitzmorris to the pin along with Lutz departing? A: We really wanted to move Fitzmorris last year and look at her on the left and see 6’6″ on the pins and Merete on the opposite at 6’8″. We thought that would be imposing and could work out. But Courtney had an injury early in the fall training and never got to develop the way we needed her to so had to put Fitzmorris in the middle. It’s something we’ve been trying to do so I foresee us keeping Fitzmorris in the opposite position or outside position for the rest of her career. Q: How about the players coming back who may not have been the household names last season who could breakout in 2018, does anyone come to mind in that regard? A: We’ve covered a lot of players but one we haven’t talked about is Meghan McClure, who was our other starter on the outside. I thought she had a really good year; I think she hit .212 which in our conference as a freshman as a 5’11” outside is really overlooked. If you look at the number of outsides in our conference I think she ranked fifth in hitting efficiency as an outside. But no one talks about her offensively, they talk about her defensively and a passer. She doesn’t carry a huge load for us but is efficient with the load that she has. I think we could see Mackenzie Fidelak as an opposite playing. You could see Michaela Keefe who is also a sophomore outside – she had a good spring. And then we’ve got a bunch of defensive specialists that are serving studs like Kate Formico, who played a lot for us and was our best passer. You don’t see her make the special plays like you see from Morgan but she does a lot for us. The cool thing about this group is we have all the roles that need to be filled and we have multiple pieces that can fill those roles. So I think you’ll see lots of people making an impact on our season, which everyone wants to see that as the coach. As long as we can stay healthy, we will have a good shot at it. Q: What will you have to do well this season to achieve your teams goals and win a National Championship? A: I think we’ve got to serve and pass at the highest level. That was the difference last year and I think that’s the difference this year. The level of physicality and the talent that’s spread out across the country – the place where people separate themselves is serve and pass. Going into the Final Four you watch Nebraska and they were the best at it so it’s not surprising that they won. We’ve got to step up our game on that and that was our focus in the spring and will continue to be our focus in the fall. That’s going to be where it comes down to, which is super boring and coaches always talk about you’ve got to serve and pass to win and all that but I think it was a deciding factor last year and I foresee that being a deciding factor this year.